The author cooking over a fire in a northern Namibian village. I’m a 33-year-old African American woman who just started feeling comfortable in the kitchen. Let me cut myself some slack. Somewhere along the line, I did learn a few basics. Mashed potatoes are pretty straightforward so I could do that. Sandwiches, white rice, pasta and the simple sugar cookie recipe were my prime specialties. But the big dogs? Some flavourful chicken or beef with some accompanying sauce? Those were not my forte. Overall, I couldn’t cook worth a ding dong. And I generally hated the entire process. You see, growing up my mother and paternal grandmother did all of the cooking. I wasn’t ever really required to sit and observe meal preparation. By the time folks started suggesting I help out with cooking I was in my late teens and completely uninterested. In one of my most shining moments I sassily challenged my mother and explained to her that I would never need to know how to cook anything for anyone. During and after college, take-out was readily available so the need to cook wasn't pressing. Then at the tender age of 26, I decided to move to Namibia to teach English. If cooking was a video game, moving to Namibia blessed me with a few lives to save myself from my not knowing how to cook demise. My first home in Namibia was in a very very small town surrounded by even smaller villages. By small town I mean two banks, two ATMs, one post office, a few schools and I think one church. There was no American sized supermarket. There were a few larger versions of what we would call bodegas in New York, but with a lot less variety. Essentially, the town was bare bones in the food department. Nevertheless, my Namibian counterparts could throw down some pretty delicious meals, mainly consisting of meats with sauces, porridge, and rice. My dinners, on the other hand, were pretty tragic. I remember a lot of sandwiches, rice, and pasta with beef sauce that year. My taste buds were screaming for a quality meal. 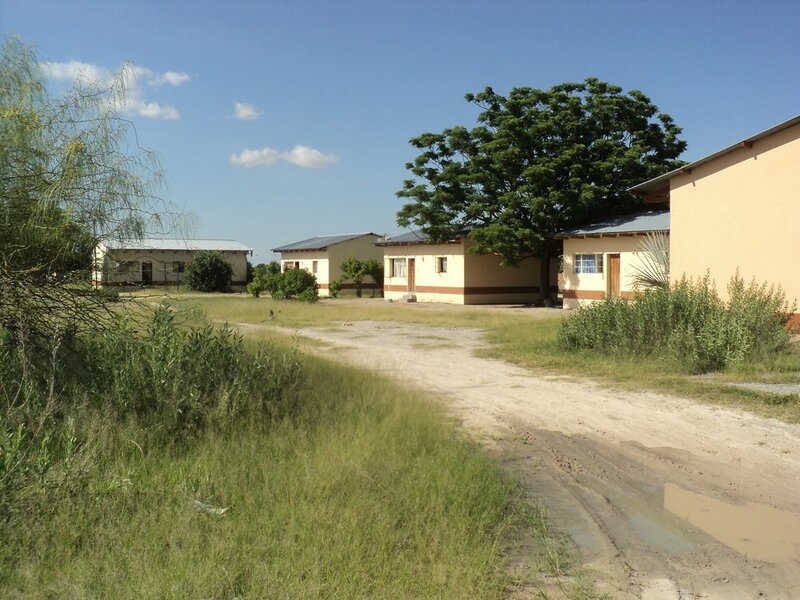 My first home in Namibia was the house on the right, on a high school campus. The next place I lived was Windhoek, the capital city of Namibia. Windhoek offered way more takeout options and also had much larger supermarkets. Remember my limited know-how in the kitchen? It didn’t matter how much fancier Windhoek’s supermarkets were because I didn’t understand how to make use of the ingredients in Namibian supermarkets. On the other hand, my Namibian husband (then boyfriend) could throw it down. He would use the popular Knorr soup packets to make the most succulent sauces. Sadly, my efforts to emulate ended up producing translucent bland replicas. Still, I kept at it and once in a while I would magically end up with a decently flavored meal. Despite my efforts to become top chef, the American in me would often run amuck. I would get these vicious cravings for very particular meals from back home. One day I’d had enough. I simply had to have something other than the local Namibian dishes and take out. Fettucine Alfredo, my favorite, had been calling my name for months on end. I googled the recipe and realized I could get all the ingredients in my local supermarket. To my surprise, I ended up making some slammin Alfredo sauce. Another time I made a Namibian version of Jamaican cornmeal porridge. I substituted local millet porridge for cornmeal (or were they actually the same thing?). It came out pretty well! Caribbean flavor. 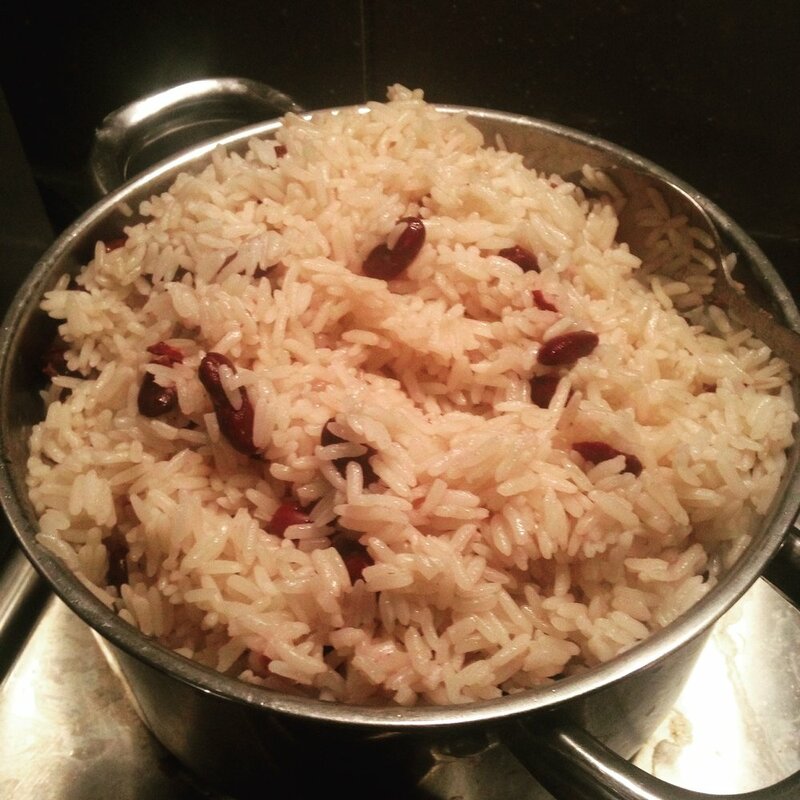 One day I up and made Jamaican rice and peas here in Namibia! Then came the big 'P'. That’s right. Parenthood. Suddenly all the ominous warnings my mother had given me about why I needed to know how to cook started to make sense. At 31 years old I gave birth to a bouncing 8 pound 7-ounce baby boy. As fate would have it, my son has always been above average in weight and had a hefty appetite. Once he hit the six-month mark it was time for him to start trying out solid foods. I quietly panicked inside. How was I going to sustain this little boy with his increasingly herculean appetite? On one hand, it was comforting to see that local Namibian supermarkets sold canned baby food. However, canned food was expensive and I’d read somewhere that it wasn't the healthiest option. I was also now living in a small town again and so I couldn't lean on takeout that easily. I had no choice but to learn how to puree foods for my infant son. All those fresh veggies I always casually floated by in my supermarket runs were suddenly vital. After googling ‘foods for baby’, squashes and sweet potatoes soon became staples of our household. I was so surprised by how easy they were to prepare! It soon dawned on me that my infant couldn’t survive on just breastmilk and veggies alone. I started to notice just how much he enjoyed meat. This shouldn't have come as a surprise as meat is a huge deal in my Namibian husband's tribe. Genetics. My husband and son buying some meat from a local vendor. This is when the real test began. It was time to face my biggest fear - cooking meat. I thought to myself, "Kaylan, you can’t let your child starve. You have to get comfortable with doing this and do it well". And so began the journey of learning how to really cook meat. Well, actually I copied what I’d seen some Namibians often do - oiling and seasoning before putting the meat in a pot to cook with some diced tomatoes and onions. I also observed them cook it for a long time, past the point that it looked done. Not some quick 25 minutes. So I tried that out and lo and behold, it worked. My chicken came out pretty decent. I later discovered that beef was even easier to make taste great (a little salt and pepper did wonders). Glory! My son wouldn’t starve after all! Now don’t get me wrong. I still very much consider myself a beginner. I’ve had a bag of peas in a cabinet for weeks that I’ve been meaning to soak overnight. (Well, that’s what the back of the bag says to do.) I’m determined to learn how to use non-canned peas and reap all of their health benefits. I still do not enjoy the process of cooking. But, I have been pleasantly surprised to discover that baking can be quite therapeutic. Visiting my in-laws in the village isn't so intimidating anymore. I used to feel self-conscious because not only couldn't I cook by the fire like they did - I couldn't cook, period. Now I feel more empowered knowing that I can hold things down in my own way. Throughout my years living in Namibia, I’ve come away with a few kitchen-related lessons. For starters, there is no right or wrong time for one to learn how to cook. I remember my mother telling me she never learned how to cook until she had children. And she was a phenomenal cook. If you’re in a relationship I’ve learned that it’s crucial to have a partner who doesn’t guilt you for not being skilled in the kitchen. No matter how random my meals have turned out, not once has my husband ever said anything negative. He’s always complimented me on what I made - or attempted to make. He greets my questions about how to do this or that with a soft heart. I think my biggest lesson goes back to that dismissive conversation I had with my mother back when I was a teenager. I’ve decided that cooking is not some push into submission or shade at my womanhood, as I once thought it was. It’s actually a very useful skill that saves money and can really help you develop healthy eating habits. Hopefully, my experience gives someone else, abroad or not, the confidence to take some baby steps towards the stove. Who knows? You might be the next B. Smith or G. Garvin in the making! Our editor has had many revelations during her life abroad in Namibia. Read more of her Namibian reflections here!